Development of the next major release of Mac OS X is well under way, with version OS X 10.9 regularly appearing in web analytics logs of OSXDaily, 9to5mac, AppleInsider, CultofMac, and several other Apple-related websites. 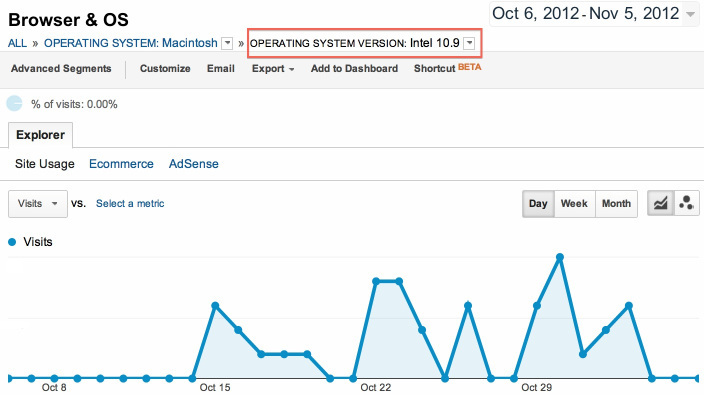 This was first brought to light today by 9to5mac, whose graph above shows a handful of visitors from Cupertino California running a new, unreleased version of Mac OS, labeled as “Intel 10.9”. Cupertino is the location of Apple’s corporate campus. For OSXDaily, the first appearance of OS X 10.9 came in logs from July 2012, around the launch of OS X 10.8 Mountain Lion. As the graph below demonstrates, there has been a consistent upward trend appearing in our logs as more and more (presumed) Apple engineers use and work on the internal build of OS X. There is open speculation as to what the next version of OS X will be called, and whether or not Apple will stick with the cat named theme. The number of familiar feline names is running thin, and though it’s unlikely Apple would choose an unfamiliar cat name for 10.9, a name like OS X Andean Mountain Cat or OS X Iberian Lynx could certainly surprise us all. I don’t doubt these are legitimate, but, these are very easy to spoof. Take such thing with a grain of salt! Yes these are easy to fake, but the same things happened with 10.7 and 10.8, and a year later we got them. 10.9 is coming next year, Craig Federighi is on it! new os x — ARM Lion ? Lion A6X ? I hope it is a false alarm. sincerely. ¡damn it! I’d be more interested in how many models they are planning will not run with 10.9. That is news I could use.